WASHINGTON, D.C. -- While President Donald Trump has previously questioned the relevance of NATO, 80% of Americans say the alliance should be maintained. 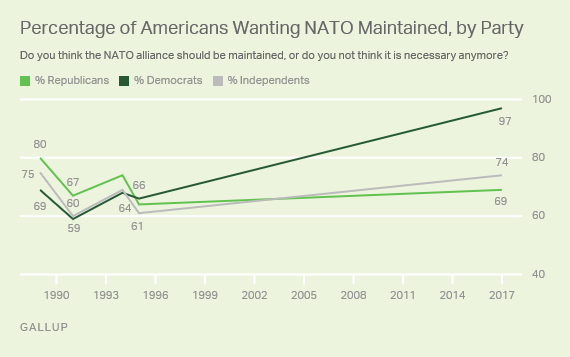 This is up from 64% when Gallup last asked Americans about their views on NATO in 1995, and the highest reading since Gallup first asked the question in 1989. High U.S. support for NATO in Gallup's annual World Affairs poll, conducted Feb. 1-5, comes after Trump questioned the country's commitment to the alliance in mid-January, referring to it as "obsolete." Trump, however, reaffirmed U.S. commitment to NATO when he recently agreed to attend its summit in May. Defense Secretary James Mattis reiterated the country's commitment to NATO this week but said the U.S. could "moderate its commitment" to the alliance if other countries do not increase their defense spending. When Gallup first asked Americans about their views on NATO in July 1989, 75% thought the alliance should be maintained. The percentage of Americans supporting the alliance dropped to 62% in May and June 1991, months before the Soviet Union's formal collapse. Three years later, support for the alliance increased to 70%, but it dipped back down to 64% in 1995 during's NATO intervention in the Bosnian War. 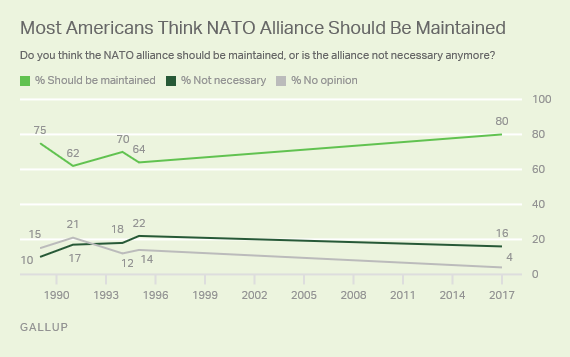 Fewer Americans have "no opinion" about NATO now than they did in previous times Gallup has asked this question, perhaps boosting this year's percentage of those supporting the alliance. President Trump questioning NATO's relevance may have affected partisan views of the alliance. Ninety-seven percent of Democrats now support the alliance, 31 percentage points higher than in 1995. Republican support increased by five points to 69%, now making Republicans much less likely than Democrats to want NATO maintained. Nearly three-quarters of independents (74%) support NATO. The first time Gallup measured Americans' views on NATO, 80% of Republicans thought it should be maintained, compared with 69% of Democrats. The gap between the two parties shrank in each of the next three measures, and dwindled down to two points in 1995. The 27% of Republicans this year who don't think NATO is necessary is up from 24% in 1995. One percent of Democrats now say NATO is not necessary anymore, down from 19% in 1995. The United States' commitment to NATO is at a critical point, as most member nations in Eastern Europe view it as a form of protection after Russia's annexation of Crimea in 2014. While the Trump administration has voiced its concerns about the alliance -- specifically regarding member nations' defense spending -- it's clear that Americans want NATO to be maintained. Results for this Gallup poll are based on telephone interviews conducted Feb. 1-5, 2017, with a random sample of 485 adults, aged 18 and older, living in all 50 U.S. states and the District of Columbia. For results based on the total sample of national adults, the margin of sampling error is ±6 percentage points at the 95% confidence level. All reported margins of sampling error include computed design effects for weighting.